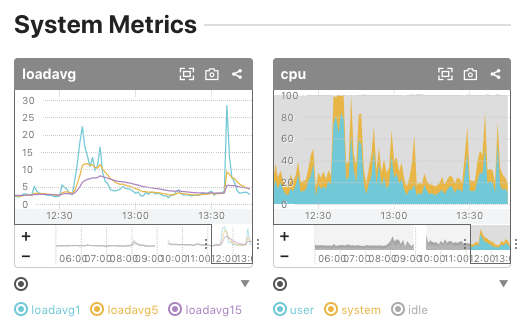 loadavg1 and loadavg15 added to system metrics etc. ISUCON8 was held last weekend and Mackerel team members Matsuki ( id:Songmu) and Shibasaki（id: id:shiba_yu36) both made it through the qualifying round. I’m looking forward to the main event. With the release of mackerel-agent v0.57.0, loadavg1 and loadavg15 have been added to the loadavg graph which previously only supported loadavg5. Now you can conveniently compare loadavg5 and loadavg15 to check whether the CPU load is increasing or decreasing. When updating mackerel-agent to the latest version, two system metric items will be added to the target host. This update is compatible with all platforms except Windows Server. With the release of go-check-plugins v0.22.1, a change was made to the inode number for when tracking log files with the check-log plugin. With this, the tracking accuracy for log files when logs are rotated has improved. With the release of go-check-plugins v0.22.1, you can now specify the number of follow up redirects with the option --max-redirects (the default is 10). In environments where ALB / ELB metrics are obtained with the AWS Integration feature, a change was made to now post 0 if the RequestCount metric value obtained from CloudWatch is null. This fixes the problem of alerts not closing automatically, which was previously caused by the null value. With the release of mackerel-agent v 0.57.0, the code signing certificate for Windows Server installer has been updated. Please note that if you use the previous version of the installer, a certificate expiration warning will occur.